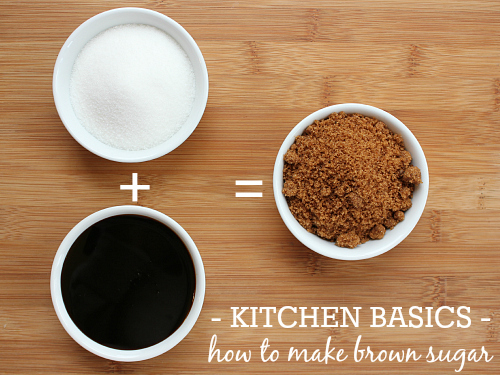 next in our kitchen basics series, we're taking a look at brown sugar. brown sugar is a staple in our kitchen. it has a sweet bitterness and it adds such depth to recipes. there are two types of brown sugar sold in grocery stores: light brown sugar and dark brown sugar. brown sugar is nothing more than white granulated sugar and molasses. it's easy to make your own brown sugar at home. you only need two ingredients: white granulated sugar and molasses. to make light brown sugar, mix 1 cup of white granulated sugar with 1 tablespoon of unsulfured molasses. stir the mixture with a fork until it is light and fluffy. to make dark brown sugar, mix 1 cup of white granulated sugar with 2 tablespoons of unsulfured molasses. stir the mixture with a fork until it is light and fluffy.